The print-on-demand fabric company, Spoonflower, launched a new division last month called Sprout Patterns. Sprout allows customers to select a fabric design from the Spoonflower marketplace and have it printed as templates for a sewing pattern. 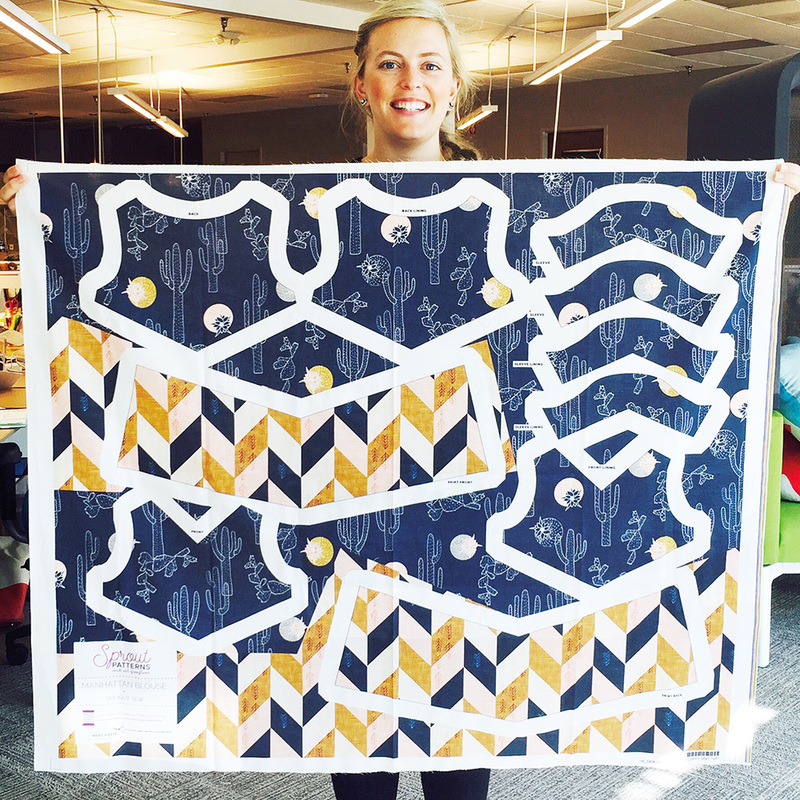 Sprout users avoid the tedium of tracing pattern pieces and get right to the fun of cutting and sewing their projects. The project is headed up by Caroline Okun who has a history with Spoonflower that dates back to its earliest days. Okun befriended Gart Davis, a Spoonflower co-founder, when they’d both worked at the print-on-demand book company Lulu.com. When Davis was preparing to launch Spoonflower in 2008 he asked her to design the logo and website. Several years later Okun left Lulu and Davis brought her to Spoonflower to serve as Art Director, a role she had until April of this year when he tapped her to be the Director of Sprout Patterns. 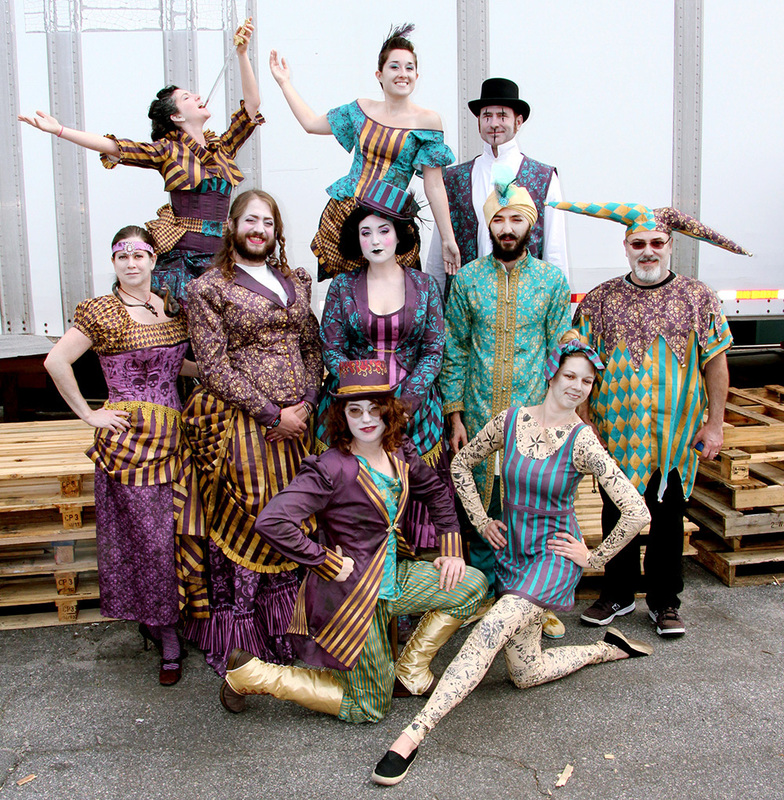 Spoonflower employees wearing circus-themed Halloween costumes they made by creating cut-and-sew fabric. In the summer of 2014 the company tried out the model on a small scale by adding a section to the Spoonflower site called Sew Projects that allowed customers to choose a Spoonflower design and have it printed as templates for either a t-shirt or a tote bag. Both patterns were designed in-house. This experiment revealed a few clues as to what people wanted in a cut-and-sew project. First, a generic sewing pattern designed in-house didn’t create enough excitement among consumers. “Nobody was really like, ‘Oh, that Sew Project t-shirt! That’s amazing!’” Okun recalls, “but they will talk about a dress from By Hand London, for example.” And second, Sew Projects had the design printed just within the pattern templates causing customers to complain that the excess white fabric around the templates felt wasteful. The idea itself was successful enough, though, for the company to invest in creating a bigger and better version in Sprout Patterns which is the first project to go live from SpoonLabs, a small, experimental area of Spoonflower. Others are in the works. A sample of a Sprout Pattern printed. One of Okun’s first tasks was to secure indie sewing patterns for the Sprout marketplace. Okun and her team put together an initial list of 100 designers. “We looked at people that had awesome social followings and awesome patterns,” she says. “Colette was at the top of our list.” They narrowed it down to 10 that would provide a nice variety including menswear, women’s garments, kids clothes, and accessories. Only one designer turned down their offer to come on board. The site launched with patterns from By Hand London, Grainline, Betz White, Hey June Handmade, Colette, See Kate Sew, Brindille and Twig, and Sew Liberated. Okun says she gets at least one email a day from a designer hoping to become part of the marketplace. Designers receive the wholesale price for each sale of their patterns and there is no requirement of exclusivity. According to Okun the company is committed to working with indie designers and has no plans to partner with the big four pattern companies. Spoonflower designers whose fabric designs are chosen by customers to go on Sprout patterns receive the standard 10% commission they receive in the Spoonflower marketplace. 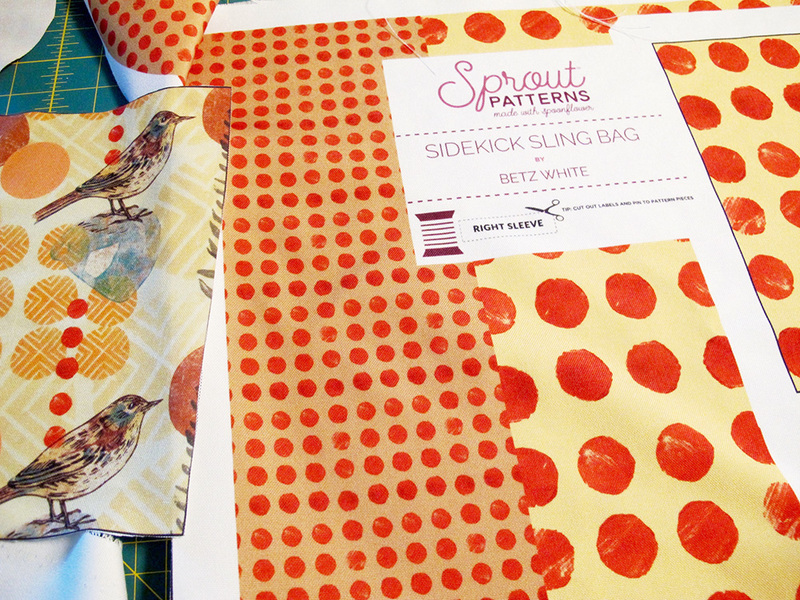 The Sidekick Bag by Betz White printed out as a Sprout Pattern. To get a PDF pattern ready for sale on the Sprout website takes a significant amount of effort. The text of each pattern is edited by Sprout to reflect the special way that Sprout patterns are cut and sewn. Templates can’t be placed on the fold, for example, and fabric is sold in whole yard increments. The document is otherwise left as is. “We want to preserve the brand integrity for the designers as much as possible,” Okun explains. The templates are then arranged on the fabric so that they fit best and the designs are uploaded to Marvelous Designer, a software product commonly used in the gaming industry that can create a three-dimensional model. Okun felt it was crucial for customers to be able to see how their fabric selections would look on the finished project. The 3-D model of the Colette Laurel Blouse using a fabric print available on the Spoonflower marketplace. Some sewists have been skeptical of the idea of cut-and-sew patterns, especially for women’s garments. One of the prime motivators for many people to sew clothes is the ability to customize sizing and fit according to their measurements. With Sprout customers must choose a particular size and the fabric is pre-printed making it impossible to do those alterations. Okun is aware of this issue and acknowledges that at this time it’s one her team can’t resolve. “It’s just very difficult to do right now because there has to be a line around the pattern pieces so that you know where to cut. We just don’t have a way to solve that right now,” Okun says. For this reason patterns that have a lot of ease or are more drapey are the best match for the site in its current formulation. “Ideally it’d be great if you could pick a size for the top and a size for the bottom and even have it laser cut here,” Okun says, emphasizing that there are lots of exciting ideas for the future. 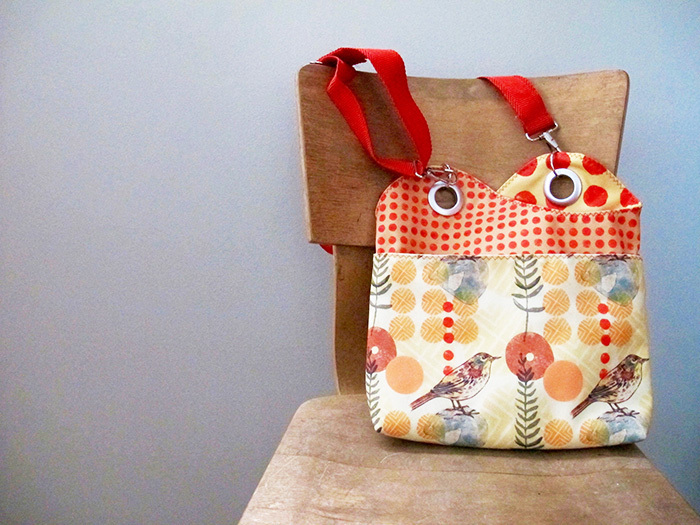 The Sidekick Bag by Betz White sewn up from a Sprout pre-printed pattern. Sprout Patterns has 35 patterns available right now and Okun hopes to have 300 available a year from now, and 1,000 in two years, including plus-sizes and more menswear. In the month since launch Sprout has taken 879 orders for 1050 items. You can reach Caroline Okun at cokun at spoonflower dot com and check out Sprout Patterns at SproutPatterns.com. UPDATE November 7, 2018: Spoonflower has announced that Sprout Patterns will be shutting down for good on December 16, 2018. Such an interesting concept, but I”m definitely one of those who can’t get my head around the idea of not being able to make any adjustments. It must be less than 10% of sewists who make no adjustments at all, even if it’s just to alter a hemline. If I can’t, then I’d rather just buy something from the store! Jenny, you can alter the patterns to some degree, it’s not impossible! If you are in between sizes or need a shorter hemline you can size up and use the PDF pattern to gauge your alterations. Hi Caroline – I, like the 80% of women who are bigger than the B cup the patterns are drafted for, have to do a Full Bust Adjustment. In my case, I often have to add 2 or 3 inches in, not to mention additional length, so I can’t see how this would be possible with pre-printed pattern pieces. While I love the concept of Sprout Patterns, and acknowledge that there is definitely a market for it out there, I think it’s not going to be among garment sewers who are at all concerned with fit. Even a drapey garment with lots of ease often requires some alteration in the pattern phase to get the best fit. I agree with Jenny 100%. Unless you’re one of the few people who are able to fit a pattern right out of the envelope–meaning your measurements and proportions match the pattern industry standard–you’re out of luck. Although Colette is singular in that their patterns are drafted for a C cup rather than a B, so there’s a little hope for the slightly fuller busted there. I just don’t think Sprout is going to be able to address this, not unless it is able to combine pattern making software with the pick-your-fabric-and-pattern-design software. And not everyone knows how to adapt patterns in pattern making software. Anyway, I give Spoonflower mad props for venturing into the cut-and-sew marketplace. I just think it’s going to have limited appeal among garment sewers. Rosie, we’re sorry you feel this way. There is definite value in getting the pieces all laid out for you, ready to cut, in your design of choice. We do have occasional sales – for instance right now all Hey June Handmade patterns are 25% off with the code: HEYJUNE25. Rose maybe you could put some money aside for a project if you really want to sew something. How about asking for cash gifts for Christmas and your birthday? Spoonflower can’t help the printing and shipping costs, these are set costs of their business. We are also going to have gift certificates for purchase soon! Hoping by Dec 1! I’m not sure I see the point? Limited styles available – even if there are a lot, it’s still less than available as patterns generally, non re-useable pattern pieces (unless you trace around the fabric outlines! and I bet that is against copyright) and you still have to cut the pattern pieces out. I never trace around a pattern either, I pin the pattern on the fabric and then cut around both. It’s the cutting bit I don’t like! If they were pre-cut and guaranteed to fit, then that might make a difference. I am really not seeing a big selling point for me here. There is also the matter of adjustments not being possible as has been mentioned. Not for me. Just to be clear you’re also getting the full PDF pattern which you can certainly reuse. Sorry, you did say that clearly in your post. My oversight. Abby is correct – in addition to the project paid out on fabric, filled with your design of choice, you also get the original pattern with all sizes and the original instructions. The addition PDF file sounds like a great deal for beginning sewers; they can cut and sew the printed fabric and then sew more versions. Everything has limits to usability and it is impossible to satisfy everyone. Customers have to remember that digital printing isn’t cheap, but is environmentally better than some of the other methods. I can’t afford to buy as much of my own designs as I would sometimes like to do. We each have to decide what is practical to buy within our own budgets. That is just the way life is and it does no good to want something we can’t afford. This is a neat idea, and sounds fun for people just starting out sewing! I’m curious about whether Spoonflower has improved the fading on their prints. I love the huge variety of designs you can choose from, but I stopped buying from them because of how quickly their fabric fades. About three years ago I made a quilt with some Spoonflower and some normal quilting fabric, and after washing, the Spoonflower was incredibly faded, whereas the regular quilting fabric looked just fine. I also have a bag made two years ago with both Spoonflower and normal canvas-weight fabric. It’s never been washed, and I can still see that the Spoonflower fabric has faded noticeably, while the normally manufactured fabric looks basically new (just a little grungier, hah). We agree, it’s a really fun idea! 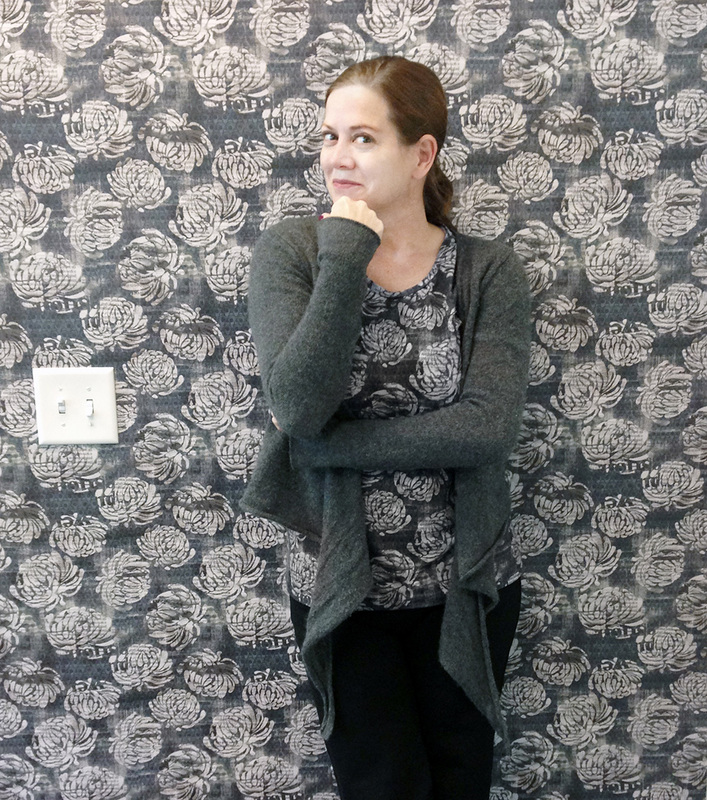 Spoonflower has a R&D team that is testing current and new fabrics and printing processes every day. Since you ordered your fabric 2 years ago, we have introduced our Ultra technology, which is fantastic for colorfastness with repeated washing for the natural fabrics. The polys use a different technology that is almost color-proof! I made some bandanas for the dogs at the shelter where I volunteer out of Silky Faille. They have been washed at least 100 times WITH bleach and still look like they’re new! I’m excited to hear this, I too had stopped buying Spoonflower fabrics due to the fading (in my case I prewashed the fabric and was dismayed to find the thread I’d bought to match for my project no longer matched it had faded so badly). If this is doing better I’ll definately give it another go! When I first saw Sprout I thought COOL, innovative, and posted from my Facebook page to a sewing group and was so taken aback by the negative reaction. I do agree 100% about size adjustments being a huge drawback – even for my kid’s clothes I almost always add rise & length to the legs. I am really excited to see some of the home dec, toy, and softie options shake out though – I’m clicking around and wondering if there is a way to get a feel for matches? That is something I have trouble with online, is mixing and matching from fabric collections. It seems like since they’re digitally printed there would be some… hex codes? .. or something that would make it easy to tell what plays well with others. Might be a cool advantage to laying it out like that. I will keep my eye out for the Collective because I’d love to see my Little Photographer Camera included! Have the fabrics been pre-washed for shrinkage before the pattern is printed on them? I don’t believe so, but like most patterns should have a little leeway built into them for shrinkage. No, they haven’t. Sprout recommends that you pre wash them. We do not pre-wash the fabric. We do account for shrinkage, specific to each fabric. Numbers are calculated according to wash tests that Spoonflower’s R&D team conducts on a weekly basis. We do recommend that you use phosphate-free detergent on a gentle cycle to launder your Sprout projects. Sprout customers may find it to their advantage to be Spoonflower members. They can save designs as favorites at Spoonflower and then access the list at Sprout. Sprout gives a good view of what different designs look like together, so there should be no big surprises. Getting the pouch that was for sale a while ago let me see basically how the site works. Nice interview, Abby. Thanks for taking us behind the scenes while covering all the bases. I have two Sprout projects ready to sew. What a kick to pick fabric designs I’ve been “pinning” and to assemble them in a 3D modeling environment, Kudos to Spoonflower and Okun’s team for launching this concept. I even received thank you emails from the fabric designers! The fading problem, however, is still a problem, at least in the poplin I ordered for the Schoolhouse Tunic. Cold water, non-phosphate soap. No luck. The rich blacks are gone. Still I’m looking forward to the sewing up the tunic and I remain a fan of Spoonflower. I’ve come to think of this printer as the little company that can and will be a game -changer for independent designers. Kate, thank you for your support! I have taken to using the Cotton Lawn because it has rich colors and doesn’t fade. Plus it’s a beautiful fabric!